Metal roofs are among the most popular roof systems in use today. Metal roofs are lightweight, aesthetically pleasing and offer durability as well as providing a sustainable solution. 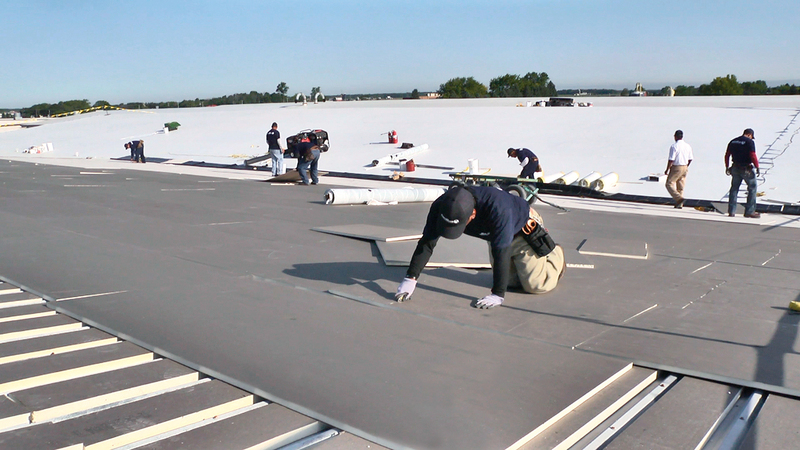 CentiMark’s metal roof systems can meet most building owner’s needs regarding roof traffic, spanning capabilities and the ability to handle common roof exhaust. CentiMark offers metal roof panels in various gauges (thickness) to meet both the span requirements for the building structure and roof traffic considerations. Various finishes are available to provide resistance to harsh environments, exhaust and pollutants. Metal roof systems are lightweight and can often be utilized in retrofitting over existing low slope roof systems. Metal roofs can be used to enhance the architectural design of your building. CentiMark offers metal roofs that come in a vast array of colors. Metal roof systems can be used to create design elements into your building. Reflectivity: Highly reflective finishes can create energy savings due to reduced heating and cooling demand. Efficiency: Metal roofs provide the opportunity for added insulation to further reduce temperature transfer into the heated or cooled building space. Photovoltaic Solutions: Metal roofs can have photovoltaic cells installed over the roof surface to be used for power generation. Daylighting: Metal roofs can be installed to incorporate the use of prismatic skylights to harness the light from the sun. Add insulation and eliminate voids in your building envelope to increase your buildings’ energy efficiency. Improve the appearance of your building with new metal panels. Increase the security of your building by eliminating voids.